Understanding local conditions in El Coco is important when it comes to buying and selling real estate, but the neighbourhood you choose can have a dramatic impact on all other aspects of your life as well. Please feel free to browse through the complimentary El Coco information I�ve provided. When it�s time to move, call me to get a representative on your side, who has experience, El Coco market knowledge, and the confidence to help you make the best transaction possible. El Coco is more vibrant than ever! There is always something exciting to do or see. Whether it is taking in a show, enjoying an outdoor festival, attending a community class, or simply hanging out and enjoying El Coco�s unique culture. It is the people that make El Coco special. This is a place to work, live and call home. Playa del Coco lies 35 kilometres (22 miles) west of Liberia, Guanacaste�s main city, and is the easiest beach on the Nicoya Peninsula to access by road from San José. and just 24 km or 20 minutes drive from the Daniel Oduber International Airport in Liberia . This pleasant fishing town is a popular destination for Ticos, and offers a variety of nightlife and restaurants. Sailboats and fishing boats can be seen scattered throughout the bay, offering a great opportunity to watch local fisherman at work. Playas del Coco is one of the best known beaches in the country. Plays del Coco is the best known for it's sports fishing , surfing, scuba diving and snorkelling. 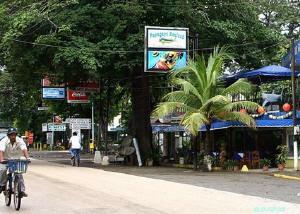 Playas del Coco is the largest village in Guanacaste province of Costa Rica. Originally known as the main Costa Rica hub for surfers with places like Ollie�s Point and Witches Rock within easy reach, this busy beach is a prime scuba diving spot, with many tour and diving companies set up here. Social life is very active and dining and nightlife are superb. Playas del Coco has a fairly well developed infrastructure, good roads and lots of shops, restaurants, bars, discos, casinos, hotels, resorts and markets . If you happen to visit the area during Christmas or Easter week expect to find a lot of people here partying �beach style�, when the main road is practically impassable from 10 pm until 3 am. The sand of Playas del Coco beach itself is a greyish-brown and the tide here often remains quite low. Surrounded by steep hills, this horseshoe shaped bay area is the ideal place to have fun. However, if you are looking for a quiet spot to relax, try staying away from the centre of town, which could be quite busy with tourists and local people. school in the area. Tuition is $7,500 per year. According to Lonely Planet, Playa Ocotal has �the cleanest and quietest beach in the area, offering good swimming and snorkelling.� Known for its breathtaking view of the Gulf of Papagayo, with lush Santa Rosa National Park across the way, Playa Ocotal is a dreamy getaway for those seeking peace and relaxation. Elegant vacation homes scatter the mountainside through Ocotal on the way to Bahía Pez Vela � then disappear from sight the moment you enter our secluded community. Once part of Nicaragua, the Guanacaste province chose to secede from Nicaragua to join Costa Rica in 1824. Famous for its unforgettable beaches, perfect climate and friendly residents, Guanacaste is Costa Rica�s most popular visitor destination. Nicknamed the �Gold Coast�, Guanacaste enjoys a drier climate than the rest of the country; the region experiences little precipitation even during the rainy season � just one of the reasons why so many feel it is �the place to be� in Costa Rica. With an international airport in Liberia, Guanacaste�s main city, and direct flights now available from Atlanta to Liberia on Delta Airlines, visitors destined for Guanacaste can bypass San José altogether � and head straight for the beach. The Nicoya Peninsula�s spectacular beaches and long Pacific coastline are the region�s star attractions. The country�s best dive sites are here, as well as ample opportunity for record-breaking sportfishing, surfing, snorkelling, swimming or just plain sun-worshipping. The area also offers excellent windsurfing and sailing. A region rich in folklore, music, colour and delicious casados (typical dishes), Guanacaste offers up the bounty of the sea to its tables, including lobster, ceviche and whole pescaditos (fish). The area�s national parks harbour some of the oldest formations in the country, such as the caverns of Barra Honda National Park, with their many stalactites and stalagmites, as well as important expanses of dry tropical forest. In addition, many of the region�s protected areas possess worldwide importance for protection of wildlife, including the several species of sea turtle that nest on the peninsula�s beaches. Guanacaste is home to several national parks protecting a spectacular host of flora, fauna and marine life. Approximately 90 kilometres (55 miles) from the property. Stroll through a network of caverns created sixty million years ago by limestone reefs thrust upward by tectonic forces. Approximately 75 kilometers (45 miles) from the property, across from Santa Rosa National Park. Rainforest, tropical wet forest, cloud forest and tropical dry forest shelter hundreds of bird and animal species and thousands of insect and plant species. Approximately 75 kilometers (45 miles) from the property. On the northern side of the village of Tamarindo, this national park protects Playa Grande, one of the world�s most important nesting sites for the leatherback turtle (baula in Spanish). Leatherbacks are the largest reptiles in the world, with some measuring an astounding five meters (over 16 feet) head to tail. Approximately 80 kilometers (50 miles) from the property. A migratory and resident waterfowl refuge, the lakes and floodplains here are inhabited by more than 50,000 waterfowl and forest birds. Swimmers, take note: crocodiles up to five meters (over 16 feet) long have been seen in the Tempisque River, which runs through the park. Approximately 60 kilometres (35 miles) from the property. This park�s claim to fame is the active volcano it�s named after; it also boasts the country�s largest populations of guarias moradas (purple orchids), Costa Rica�s national flower. 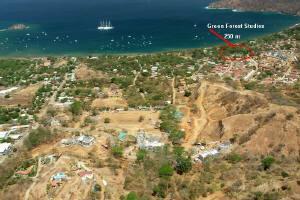 Approximately 75 kilometers (45 miles) from the property, across from Guanacaste National Park. This park harbours important habitat for protection and restoration of Costa Rica�s Pacific dry forests, as well as several sea turtle nesting sites.